It is the top of the page. IS-mini 4K is the 4K/UHD version of popular IS-miniX. It supports 12G/6G/3G/1.5G-SDI signals to process LUTs up to 4K resolution image. Image quality and performance is exactly the same as IS-miniX, which means, IS-mini 4K is usable for not only previewing but also creating main contents or live broadcasting. WonderLookPro V4.1 or later supports IS-mini 4K. This state-of-the-art real-time LUT creation software is provided for free to all IS-mini series users. IS-mini 4K also supports HDMI 2.0 output, which means you can use consumer 4K TV sets to monitor the conversion output. Is-mini 4K also has 12G-SDI bypass output which is a passive loop thru function that outputs clean signal without color conversion. This is useful when you have to monitor before and after the color conversion simultaneously. Aid of monitor calibration function of WonderLookPro, you can use it very close reproduction of 4K HDR mastering monitor. IS-mini 4K & WonderLookPro are very useful when producing live events with multiple cameras, especially when the cameras have different sensors and therefore different color looks. 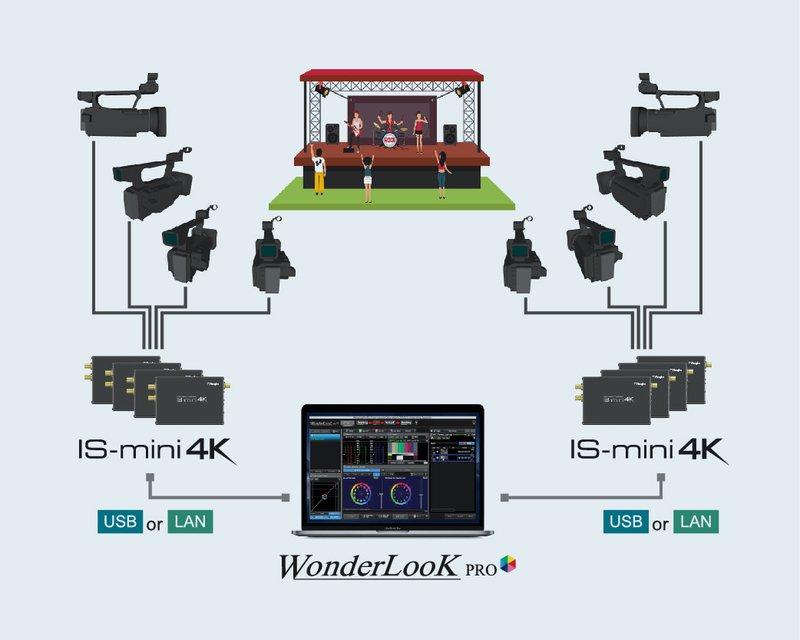 Multiple IS-mini 4Ks can be deployed and all connected to the control PC with WonderLookPro installed via Ethernet. 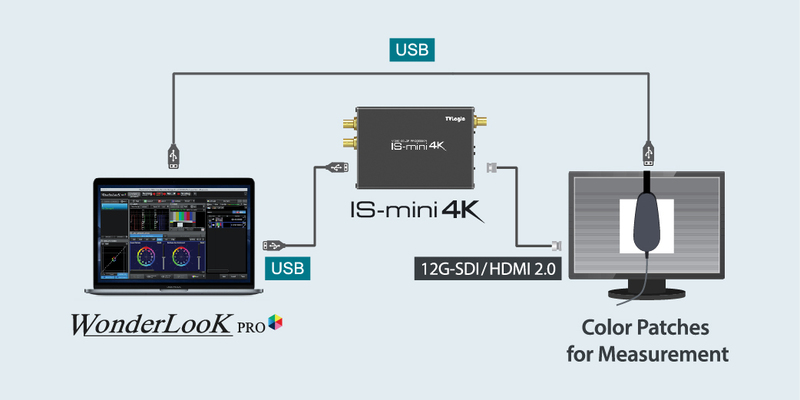 WonderLookPro has a good scalability, so you can connect and control more than 100 IS-mini 4K from one PC. Every IS-mini 4K will be set to proper camera IDT, which eliminate the difference between cameras, and you can apply your original look to all of the cameras. 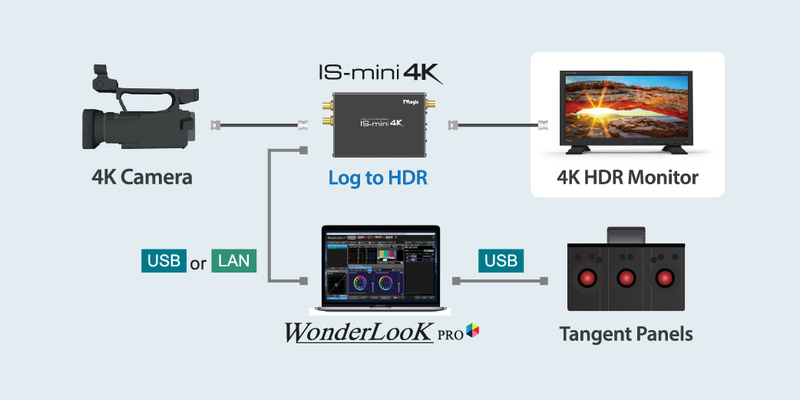 WonderLookPro can create and transmit all the important color standards for TV and Cinema to IS-mini 4K. A real-time color conversion includes SDR-to-HDR, HDR-to-SDR or Camera Log-to-SDR/HDR color conversion is made with 10bit precision 3D LUT with unique interpolation technology. IS-mini 4K has color patch generation function, same as IS-mini, which enables to profile the monitor color reproduction to make monitor calibration 3DLUT. IS-mini 4K can output HDMI2.0 10bit signal, which means you can calibrate consumer 4K TV sets to 4K HDR color spaces. It will be a good solution to setup large size client monitor with reasonable cost. WonderLookPro provides big database of camera profiles made by actual measurement of color characteristics of professional cameras. 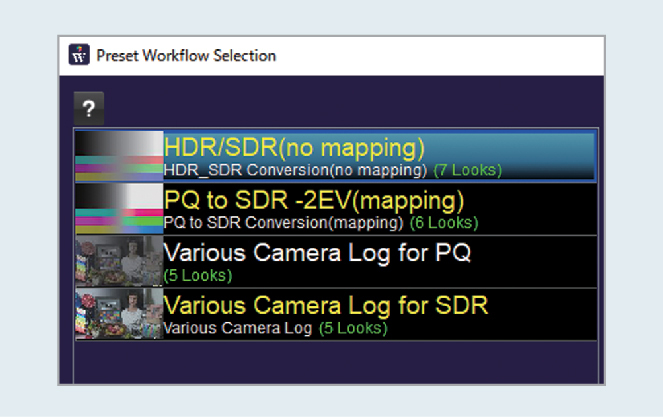 Based on this database, any conversion from the camera Logs to all standard color formats including SDR (HD/UHD), DCI and HDR(PQ/HLG) can be easily made with several mouse clicks. Captured frame images and created LUTs can be saved and sent to post production for fast and easy application of the LUTs from On-Set. WonderLookPro also supports Tangent Panel via USB that enables professional grading On-Set. * IS-mini 4K’s capturing function will be available on the next firmware update. Firmware update can be done by just running WonderLookPro with IS-mini 4K connected under internet connection. From here to the footer.